YES! 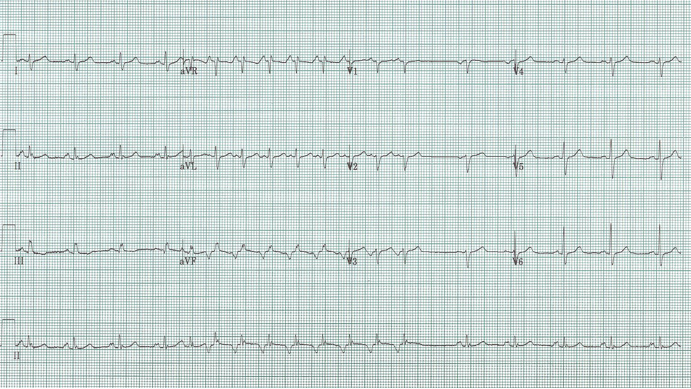 This is an acute anterolateral STEMI occurring with a RBBB. 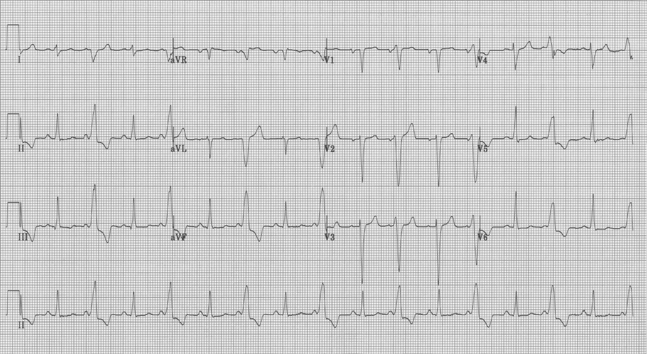 Unlike its cousin, a LBBB, a RBBB does not obscure ischemia and infarct patterns. Again, it is important to be familiar with some expected repolarization changes with a RBBB (essentially T-wave inversion in V1-3, leads with the most obvious depolarization changes). This EKG is impressive for the ST-segment elevation in leads V2-4, including “giant R waves” in V4-5, the earliest signs of STEMI. There does seem to be subtle, probably early, reciprocal ST-segment depression in the inferior leads, supporting the diagnosis of STEMI. 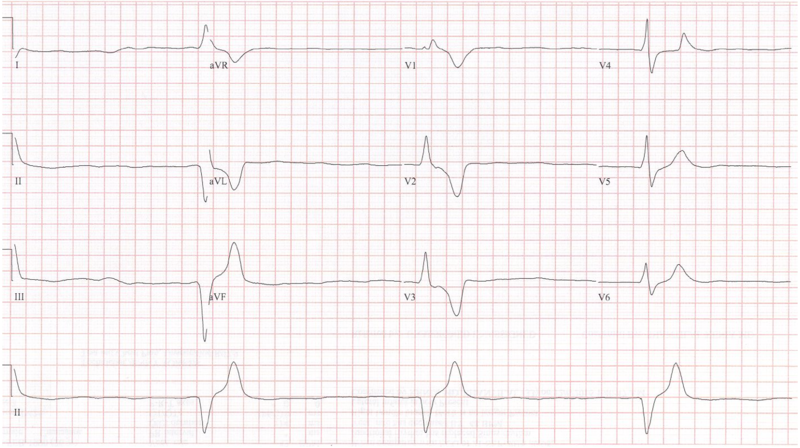 ST-segment elevation in V2-5, as well as ST- and T-wave changes in I, aVL and V6; notice also the T-wave inversion in III, a reciprocal change to the anterior-lateral infarct. 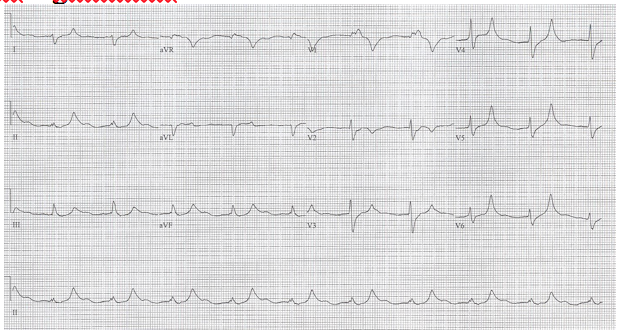 What is the etiology of the early beats seen here? And why? 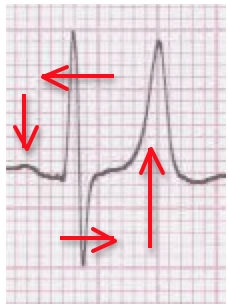 There are two premature beats seen in this rhythm tracing (#4 and #7). Although they appear similar in morphology to supraventricular beats, both are PVCs by criteria that define the difference between PVC and PAC. Both beats are followed by a pause – in these beats, a compensatory pause, which implies that the next P wave was undisturbed by the premature beat. Another way of saying the same thing is that the sinus P waves “march through” the premature beat, or that the sinus metronome marked by regular P and QRS complexes is undisturbed. 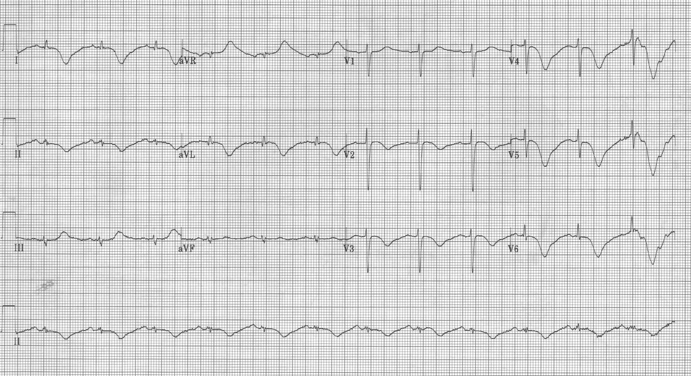 Each of these descriptions say the same thing – these premature beats are both PVCs! 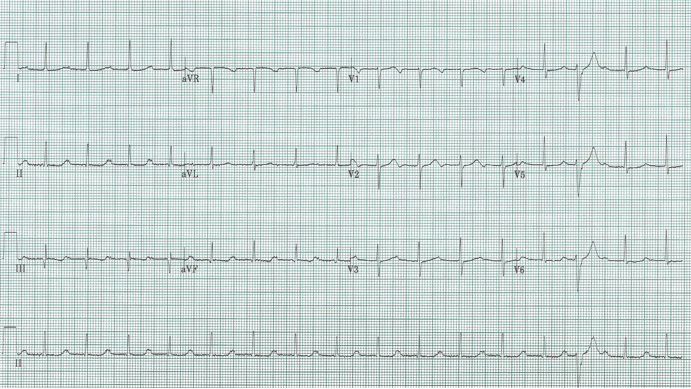 40-year-old woman with palpitations earlier this day. 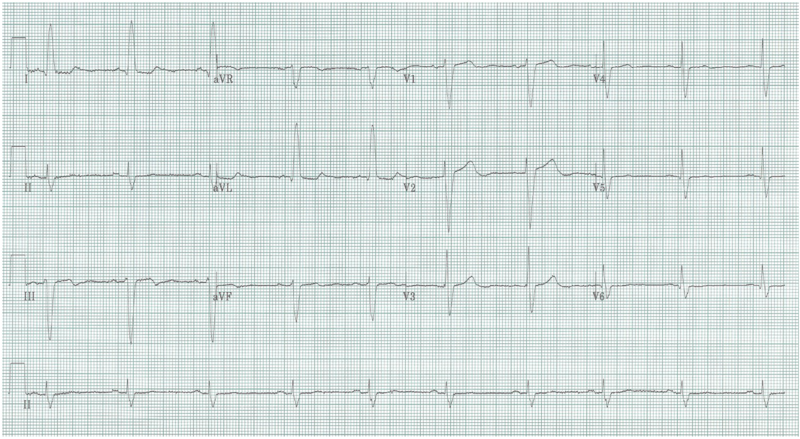 The rhythm is sinus with an alternating QRS complex morphology – every other QRS is wide with a LBBB morphology. 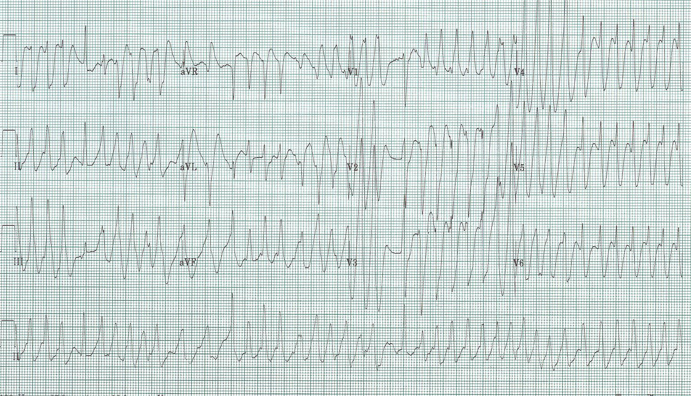 Further evaluation of the wide QRS complex also reveals a short PR interval – this is Wolff-Parkinson-White syndrome with a bypass tract that conducts intermittently. Thus it is a great comparison of a normal AV node conducted complex with the altered complex of Wolff-Parkinson-White (a “fusion” of AV node-His-Purkinje conduction with abnormal ventricular depolarization via a bypass tract). 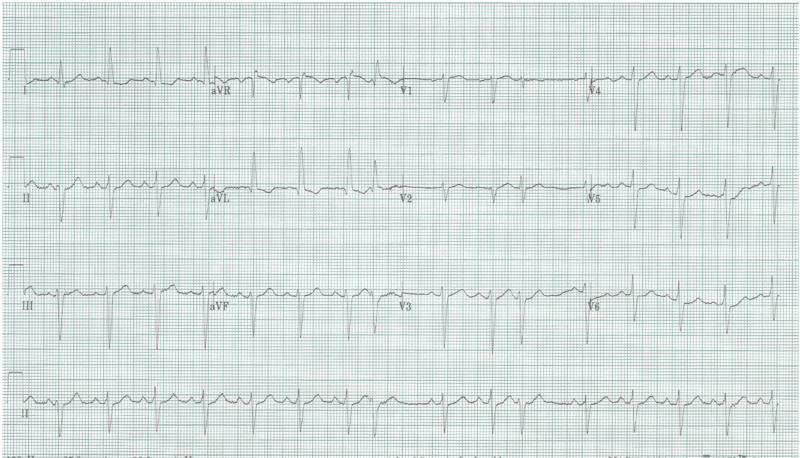 The trick to this EKG is to recognize WPW as the cause for the wide complex beats – it might be tempting to diagnose bigeminy, or even, intermittent LBBB. 58-year-old woman with COPD presents with a cough and darker sputum for 1 week. EKG read as atrial fib. What do you think? There are two irregularly irregular rhythms – atrial fibrillation and multifocal atrial tachycardia (MAT). 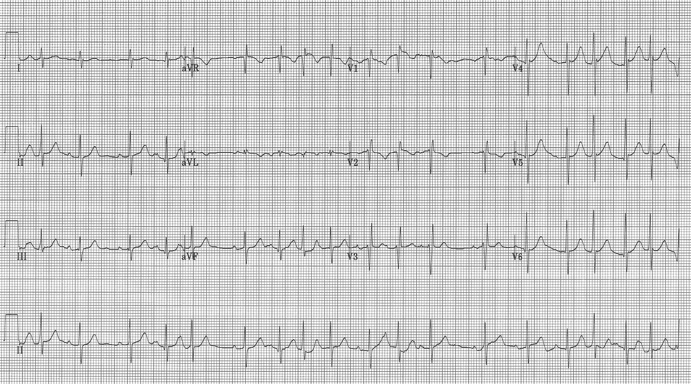 MAT is defined as >3 ectopic atrial foci with P waves of differing P wave morphology and differing PR intervals. The R-R intervals are necessarily irregularly irregular. In many of the R-R intervals in this lead II rhythm strip, notice that the T wave is “deformed” by the addition of a P wave. MAT is often seen in COPD, especially during exacerbation. Other causes are any critical illness, especially with depletion of electrolytes and cations. There is no specific treatment of MAT – first, remedy any underlying process like hypoxia, exacerbation of COPD, fluid status. And remember this sneaky rhythm when atrial fibrillation with very rapid ventricular rate doesn’t respond to usual treatment for a fib – it may be misdiagnosed multifocal atrial tachycardia (MAT)!